digital literacies (the ies ending is an idea of Doug Belshaw while doing his dissertation, which can be found here) are contextualised, there is not such ‘A THING’ that defines it. It will depend on the context. I am relating this to the presentation I just saw from All Aboard were they aim -via wide consultation- to create a digital road map to help and guide institutions and organisations in the development of local and national digital strategies and to ensure alignment, coherence and a sense of common endeavour at a sectoral level. In relation to the contextualisation of digital skills that Doug mentioned, I think if it would be worth thinking about mapping the digital skills needed in my institution and see how can we provide students with opportunities to acquire those skills during their course at the uni. 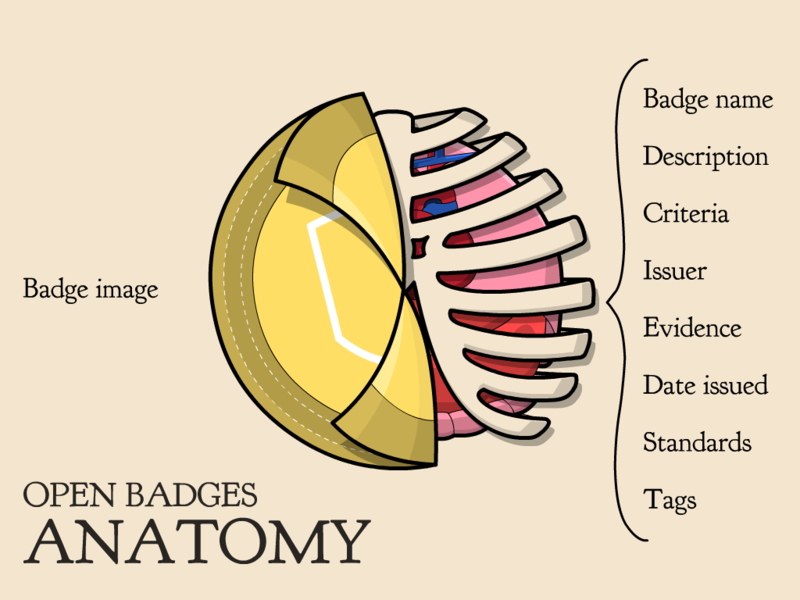 The idea with this anatomy is to understand what information is important in order to issue a badge and the process involved in issuing and getting it. This image is about this process. There is the person or institution, let us call it X, who is issuing the badge and the person, Z, who is interested in obtaining it (people need to get some external recognition for what they have learned outside formal academia, is part of the things you need to account for to get a job); Z needs to know what is wanted from her/him, what is the criteria that she/he needs to know in order to plan what is needed to accomplish the task. Z then needs to collect evidence that respond to the criteria. Once the evidence gathered is assessed the badge is issued. So in order for a badge to be a scaffolding aid for a learning path the idea would be to point out to some of the milestones that a particular learning path should accomplish and those milestones could be the evidence upon which the badge will be issued. 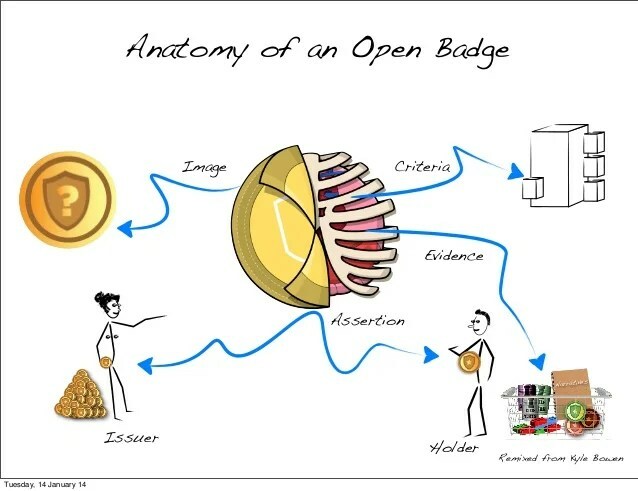 Or maybe to design your own learning path and start to gather evidence for it with badges. I think it depends on the experience of the learner among other things. Working with personal learning environments (in HE setting) as an aid to improve digital literacy I need to be clear about what am I referring to when I talk about digital literacy and secondly I need to define what do we mean with the word technology in the educational context. Those are 2 key ideas that need to be bounded and defined at least in the context of my thesis. Questions like what is the difference in relation to learning for a student in 1815 and one in 2015? What was revolutionary in the class of 1815? What was the newest technological device of that time? Was the use of the slate a revolution then? and the big blackboard in the center of the wall, how does this invention impacted the learning experience of students and also of teachers? How did they adapt to such a revolutionary technique? What did it change in the learning experience? What could students do with the slate they could not before it? What was the impact on reading and writing for society? How did this impacted humans way of thinking about different subjects? Learning pathways, how to design them? With students? Scaffolding–> how do we scaffold people’s skills? Prescriptive or descriptive badge: we don’t have to be prescriptive don’t need to go ahead of time. Follow what students are already doing because they are doing! The project’s final objective is to produce recommendations for policy and practice regarding the enablers and obstacles to a holistic implementation of key competence development. Key competences are combinations of knowledge, skills and attitudes, which facilitate the application of knowledge to real world contexts. International research suggests that individuals need them in order to function effectively in the 21st century. identity why do teens seem strange online? privacy why do youth share so publicly? addiction what makes teens obsessed with social media? danger are sexual predators lurking everywhere? bullying is social media amplifying meanness and cruelty? inequality can social media resolve social divisions? literacy are today’s youth digital natives? Web-based school collaboration has attracted the sustained attention of educators, policy-makers, and governmental bodies around the world during the past decade. This book sheds new light on this topical but ever so complex issue. Drawing on a wealth of theoretical and empirical work, it presents the various models of available school twinning programs and explores the cultural, political, and economic factors that surround the recent enthusiasm regarding collaborative initiatives. Moreover, the book critically examines teachers’ and students’ experiences of web-based school collaboration. In particular, it develops a realistic perspective of the range of challenges they face and identifies the host of technological and non-technological issues that can shape participation in collaborative programs.